Rosemount is pleased to present our Mature Chicken! Look no further for great texture and flavour in a Whole Chicken. 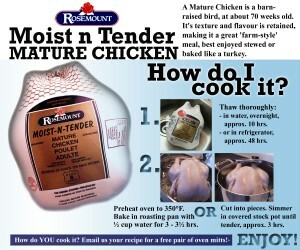 Look in-store for Rosemount’s MOISTnTender brand Seasoned hen in a retail package, or our NEW Unseasoned Mature Chicken! Large, 6-7lb birds, packed 6/box. (AKA Stewing/Boiling/Baking Hens) – Must be thawed completely, then cooked low and slow like a turkey, slow-cooked in the crock pot for the day, or stewed in your soup pot on the stove.